One of the fastest NVMe SSDs for $184 is the best deal we’ve seen on it. How about a juicy discount on a WD Black SN750 NVMe SSD to kick off your week? The 1TB model has had its price slashed by $66 on Amazon. That reduces it to a tempting $183.99 instead of the retail cost of $249.99. This is also the cheapest it’s ever been. Which isn’t a bad way to start Monday, particularly if you’re in the process of upgrading your rig, as this is one of the quickest SSDs we’ve seen in 2019. WD has long been a fixture in the market, but their Black NVMe SSDs mark a concerted push into the gaming space. When I sat in on the product’s launch back in January, they suggested it has 25/30% more power efficiency, better latency, and less throttling than the competition. WD also suggests that it can transfer data at up to 3,470MB/s, which is just under 3.5GB per second. What’s more, dedicated software allows you to track temperature, performance, and more. It’s a bit of a monster, then—especially the 1TB version. 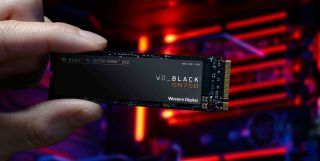 If you’re looking for a new solid state, but don’t have the budget for the WD Black, then here’s our look at the best SSDs for gaming in 2019.